First step - don't let the enemy walk right in and fill their pockets with your riches. The freedom to assign labor at any time takes some getting used to. You know - unless you come from PC games and have had that all along. 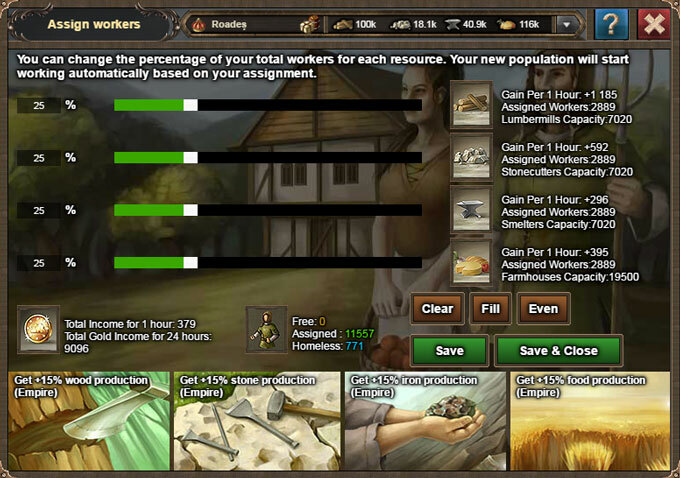 We could have solved that for you like the others in the genre, by designating a fixed amount of income from each step, but why have an economy if the only difference between players is how much time they invest in it. If someone overproduces Food, and they now need a lot of iron - they have to wait or trade, or risk someone looting their extra Food while they get the other stuff. Providing a playground where people can have these setbacks gives a strategic advantage to those of you who keep an eye on your development. You know what you want to do next. You have a good idea how much it costs. Doing it in the fastest way possible gets you ahead of your opponents. Even if you planned well, sometimes a good opportunity for trade will arise and you'll need to shift priorities while you are in the middle of somthing. Managing the various expenses, what to prioritize and keeping your research up to speed in important areas is part of what can make you the undisputed Champion of the realm. Just don't forget to use rituals and loot the npcs when you need to boost yourself.